An imaginative adaptation by David S. Craig, the play follows a fan dropped by a young lady from a balcony into the village piazza. It breaks. Her lover secretly tries to replace it. The new fan sets out on a journey from shopkeeper to seamstress to innkeeper to shoemaker to baron and count. Along the way, it stirs up misconceptions and gossip, sets off meddling and intrigue, unleashes pent-up grudges and jealousy, jumbles up the class structure and leads to fist fights and fainting fits by men and women alike. In the process, it exposes the empty pretensions of the nobility and the irritating idiosyncrasies of humanity. It strips the mask of idyllic calm off small town life. It also opens up in each of the characters a new and painful awareness of their deepest desires. Winner of the Rideau Award for Outstanding Adaption, Nominated for the Capital Critics Circle (Ottawa) for Best Professional Production. 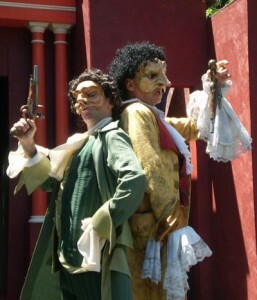 Goldoni is the undisputed master of classic Italian comedy. He had a genius for inventive plots, unfolding through a ballet of words and a symphony of action. 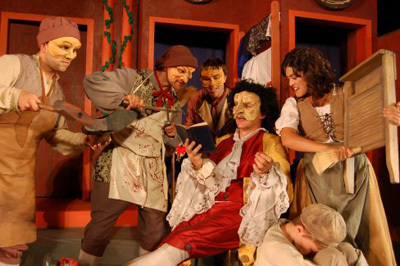 Steeped in the traditions of Commedia, he was also the great reformer who renewed the art form with his astute perceptions about real people, their psychological inclinations, and the depths of their secret passions. Click here for the blog from the Odyssey Theatre’s production of The Fan. Laurie Stevens, the Artistic Director of Odyssey Theatre in Ottawa, asked me to direct a play for her theatre’s 25th Anniversary Season. Odyssey has championed the use of theatrical masks and physical theatre in all their summer, ‘theatre under the stars’, productions and has achieved a very high level of experience and expertise so I was very sympathetic to their style. 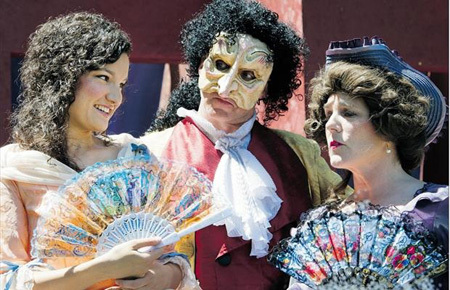 We went through about ten different titles from ancient Greek to Restoration Comedy but The Fan struck me as a lively celebration of life that would perfectly match the taste and expectations of a summer audience. Goldoni is a master comic writer with almost three hundred titles to his name. But his real strength lies in his dramatic structure which is outstanding. When I say dramatic structure I include the characters and although he famously reformed the Italian Theatre by imposing written dialogue on the actors (who were improv kings and queens), his dialogue, by current standards, is, well, clumsy. So I took an old translation, one that was in the public domain, and took a power sander to it. All the major characters and every scene remains but the dialogue has been focused and polished to suit a modern audience. I also, in two cases only, dropped in wonderful ‘bon mots’ from other writers of the period including Talleyrand who said, “When I examine myself, I worry. When I compare myself I am reassured.” It fit so perfectly into the mouth of the Count I couldn’t resist adding it. What Goldoni could not know in 1765, when the play premiered in Paris, and I expect could never have imagined, was that twenty-eight years later King Louis XVI, the most powerful man in the world, would be driven in a horse cart to Place del la Concorde, where he met the guillotine. Goldoni must have been frightened of hearing a knock on his own door. At the time, he was teaching Italian to the royal family. He was spared, but only survived Louis by two weeks, having lived almost the entire enlightenment period. Although his plays and memoirs show no interest in political reform, the social and economic inequities that led to the French Revolution are clearly, and comically, presented in this play. I have heightened these as they reflect, in my opinion, the revolutionary spirit that is dominating our modern world.